To make BBQ sauce, add olive oil to a medium pot over medium heat. Once hot, add chopped onion. Let onion cook for a few minutes until it's soft, then add other BBQ ingredients. Bring BBQ to a simmer and turn heat down to low. Simmer until sauce is very thick, about 30 minutes. Stir frequently. For burgers, lightly mix beef with an egg, stout, and some salt and pepper. Form mixture into 9 evenly sized small patties. Heat a cast iron skillet (or you could grill these) over medium-high heat. Add a bit of oil and once hot, cook sliders for about 3 minutes per side. Meanwhile, heat rolls on a baking sheet in a 350°F oven for 2 minutes. Serve sliders with BBQ sauce, pickles, and red onions. You'll have leftover BBQ sauce. Save it. It's good stuff! It's always best when St. Patty's Day falls on a weekend (for obvious reasons), but a Thursday will just have to do this year. Don't worry. We get it right in 2012! 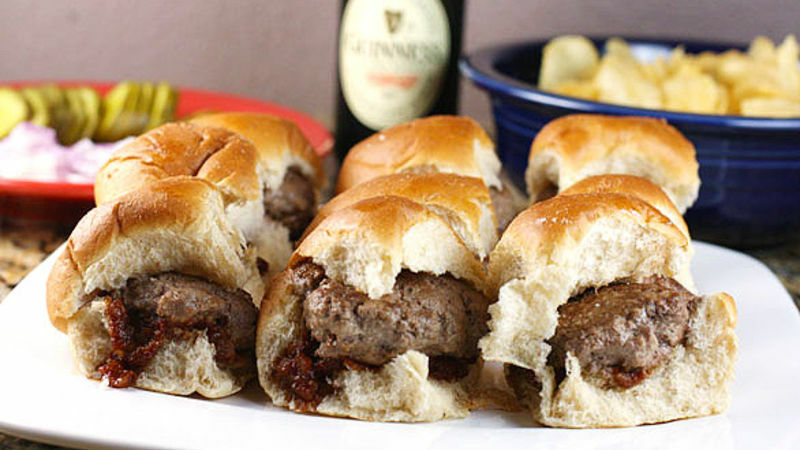 Whether you're looking for something to eat today or over the weekend, these St. Patty's Day Sliders take advantage of an ingredient you'll probably have on hand: beer. Irish stout, to be exact. While there's a bit of stout in the sliders themselves, you can really taste it in the homemade BBQ sauce, which is out of this world! You could put the BBQ sauce on almost anything, but it's especially good on tiny burgers. You'll want to get the BBQ sauce started first for this recipe since it needs to simmer for about half an hour to really thicken up. It's worth the wait though. Trust me. Start by adding your oil to a medium pan over medium heat. When it's hot, cook the onions for a few minutes until they’re soft. Then add all of your other BBQ ingredients! Bring this all to a simmer and cook it on low until it's nice and thick. It'll probably take about 30 minutes. When it's done, you should be able to drag a spoon or spatula through it and leave a trail. While the sauce is cooking you can prep the burgers. These are pretty basic, but I did sneak in a little beer – which keeps them really juicy. Try to keep the mixture nice and light. Just form the beef into 9 even-sized patties and set them aside until you're ready to cook! Before you cook the sliders, make sure you get your buns ready. I warmed mine for a minute or two in a 350 degree oven. And slice up some pickles and onions for toppings. You could add cheese if you wanted, but I wanted the BBQ sauce to be the star. Cooking the sliders is really easy. Just add a drizzle of oil to a heavy skillet. Cast iron works well. Put it over medium-high heat and once it's hot, add the sliders. They should all fit fine in one batch if you have a large skillet. Cook them for about 3 minutes per side. When you're ready to serve, just add about a tablespoon of BBQ sauce to each roll and top it with a juicy slider! Obviously, these would be a great appetizer anytime and you can use any dark beer for them. They just happen to be particularly good on this special day! Nick is wearing green underwear today on his blog Macheesmo and on his Tablespoon profile.